During the time I have been working with Hope Builders Ministries Zambia, I have seen many things which the Lord has done here in partnership with HBM USA and local Indigenous pastors. Much of what I am going to share is based on growth of this ministry. Hope Builders Ministry has now reached all the 10 provinces of Zambia. Western and Eastern provinces were the last 2 provinces to be reached. In Western province, I have met Bishop James Nswana who is based in Mongu which is the capital of the province. James has started training 3 pastors in Mungu who will train others and plant new 3 churches. Initially, James was ready to start with more than 20 pastors in this province but I had to ask him to choose 3 for a start. In Eastern province, Pastor Joseph Phiri who is our Regional leader in the Northern Province has opened hubs in Petauke, Chipata and Lundazi. The training of pastors in this province is going on well. As HBMZ Administrator, I want to testify that the demand for enrollment of pastors who want to be trained has multiplied. I have been receiving requests from all the districts in Zambia from our pastors who are being asked to start receiving new pastors for training. Some churches in the villages are asking their pastors to train with HBMZ as they are not willing to be led by untrained pastors. All the pastors who started training in 2012 and 2013 now have 3 disciples each in training. Apart from training their 3 men, these pastors are teaching the members of their congregation what they are learning. In some villages, even headmen have been converted and many people are being saved daily because of what HBMZ through these men are doing. I thank God for the wonderful training materials which our pastors are receiving from Hope Builders Ministries USA. As a result many called out men being trained, I have seen and bear testimony to the multiplication of many Bible believing churches in all our districts. In Muchinga province for instance, Pastor Fighton Chilufya, one of the district leaders, has reported to me that more than 100 churches have been started. Brother Fighton is based in Mpika which is one of the largest districts in Zambia. Many people who live in these remote areas are so poor and their way of life is different from those who live in towns. HBMZ is focused to planting many Bible believing churches in these rural areas. During the month of June this year, Brother Jeff (HBM Zambia Coordinator) and 2 other American Brothers will be visiting us. We shall have Bible teaching Conferences in 3 provinces, namely, Central, Copperbelt and Northwestern. We also plan to give Bibles to our pastors but this depends on your support. Finally, I am asking for your prayers as we travel on our Zambian roads which are bad more especially in the remote areas. Thank you so much for everything you have been doing in supporting us. Ever since I joined Hope Builders Ministries, my mind set has been changed and challenged for better. Before, I was limited to my local church and denomination only, but now I have been challenged through the training to think of all Zambia and even the world and look at the work of God on a much broader perspective, going beyond the 4 corners of the church and disciple people. After the change in my perception of the work of God, the local church that God has given me the responsibility to pastor and oversee his people started growing spiritually and numerically. It is true Brothers, “you grow a pastor, and you grow a church.” The growth of a pastor is an increasing blessing to the local church and the Kingdom of God. Hope Builders Ministries will never make the local church go down; it will always make the work of God grow. Let us do our part, God is ready to do his part and the result will always be amazing. Hope Builders Ministries Zambia is an indigenous ministry in Zambia with a mission to train pastors in the Word of God and provide biblical strategy to multiply disciples of Christ through the country and the world. Hope Builders Ministries is partnered with HBMZ to provide resources (bible training, bibles, bicycles, motorcycles, business loans, Dignity Project support) to help them declare the Gospel of Jesus Christ in Zambia and neighboring countries. On Saturday the 2nd of February 2014, I went to Kansununu Church started last year with my wife. It is 60 KM away. We reached at 1 PM and after we had rested for a while, we went visiting at the nearest villages. A church leader and his wife accompanied us. At one of the villages, we found many people sitting and we greeted them. One of the villagers told us that they had a 12 year old boy who was very sick and they were all waiting for him to die. In this village only 2 people are members of our church and the rest are Jehovah’s witnesses. When the Father of the sick boy saw us, he invited us to go in the house and see the sick boy. As we entered the house, many close relatives were seated by the sick boy who lay on his bed and he could not even speak nor take a cup of water. The boy’s father told us that his son had been in the village hospital for 3 weeks and they said to take him to Solwezi but they were unable to do so and so discouraged that they decided to take the boy back to the village as they had now lost all hope. They did this because all the people in this village suspected that this boy was bewitched by an old woman. When the boy’s father and the sick child arrived at the village from the village hospital, people grabbed the old woman and started beating her because of the boy’s illness. The Boy’s father pleaded with us to help him because if the boy dies, then the people would also kill the old lady. I calmed the people and opened my Bible. I spoke the word of God on what the Bible says about sickness and death. After I preached the word, the people who were in the house went outside and only the parents and the church leader who accompanied me were left in the house. We prayed for the boy and sang songs of praises to our Lord Jesus Christ. After the prayers and singing, we went back to the village where we had to spend the night. It was now about 8 PM. At around 3 AM, the father of the boy knocked on the door were we were sleeping. I thought that he has now come to tell us about the news of the boy’s death. The man told me to go to his house as the boy was now speaking and asking for some food to eat. We went there and found the boy eating porridge. We gave glory to our God for the healing of the boy. Even the many people that mocked at us when we were singing believed in God. On Sunday, 7 people from that village and the suspected old lady came to church and they gave their lives to the Lord. The boy also he is well and the parents are praising God for the healing. God Saves and Heals today! So she had come to me for prayers. I asked her if she knew and believed in Jesus Christ. I discovered from her answers that she was a religious person who believed in salvation by works. She and her family worship at the New Apostolic Church. She professed her faith in Christ after sharing the gospel of Christ with her. Thereafter I prayed for George in absentia. I went visiting with the family the following day. I shared the gospel with George too. Who subsequently professed faith in our Lord Jesus Christ. Two days later, George was completely healed and able to get up and move about. Indeed Jesus Christ is the same yesterday, today and forever. May he alone, be glorified and praised. Amen. 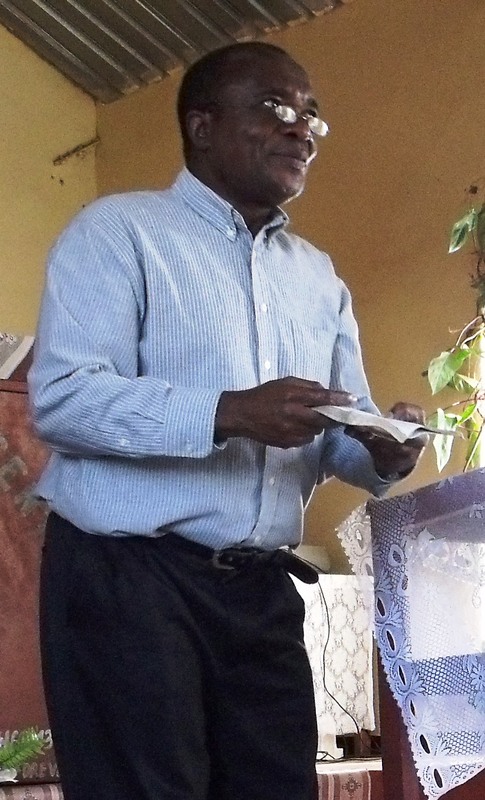 Pastor Sakala is a Bible scholar, discipler of pastors, church planter, apologists and evangelist. We thank the Lord for this man of God. He graduated 14 men last July from our 3 year Calvary Academy. He presently has another class of 10 HUB pastors in training. Your gifts to Zambia enable Hope Builders Ministries to support this brother in training and equipping men who are called to be pastors but are not able to receive training in colleges.